On Saturday, October 29th Berkshire Bank presented Soldier On with a $6,675.00 donation derived from the Military Checking Account Promotion. 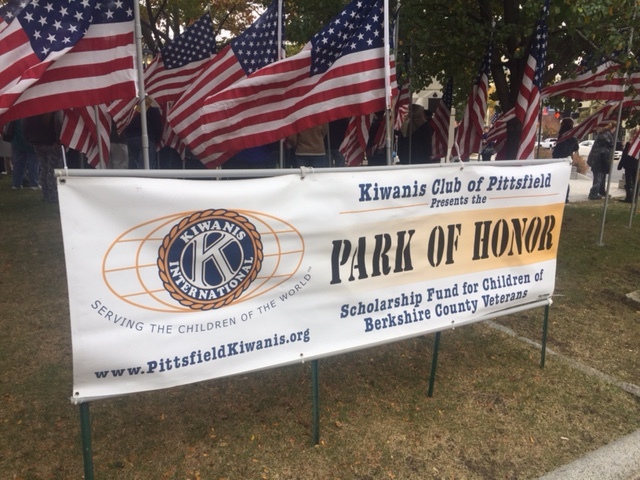 In its third year, the Kiwanis Club of Pittsfield has gotten even more flag sponsors and has filled Park Square and even expanded to a park in Sheffield. The organization has sold more than 740 flags in honor of veterans, the profits of which will go to college scholarships for children and grandchildren of veterans. “The best part of the project is it is growing and it keeps growing,” said Chairman Real Gadoury, who said more than $24,000 will be raised through the local effort. 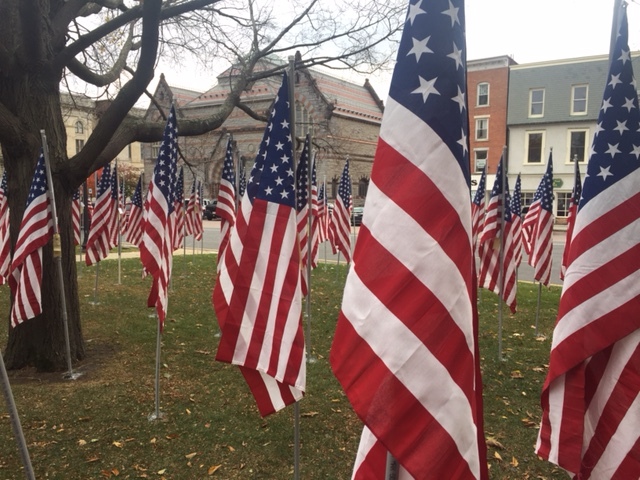 In Park Square, 640 flags are flying, each with its own dedication to a veteran. Another 100 will be in Sheffield. But, all of the money raised will stay right in the Berkshires, helping the families of veterans here. The Park of Honor program started three years ago with the hope of selling 200 flags. The club sold 523, which allowed it to give out a dozen $1,000 scholarships. Last year, 670 flags were sold translating to $24,000 in scholarships. Now, the club has surpassed that figure. Next year, Gadoury said he hopes to see this program be replicated in more cities and towns in Berkshire County. Mayor Linda Tyer says of all the compliments and praise she hears about the city, the flags are the most talked about. The flags are flown in the park throughout the month of November. “I am proud of our city and our citizens,” she said, after telling a story of a wounded veteran who despite losing a foot was able to climb Mount Everest. The story focused on the family of that man and Tyer used it to illustrate how families of veterans have “profound experiences” — something she knows firsthand from being the daughter of a career military man. The program of speakers on Saturday kicked off the monthlong honor. Additionally, Berkshire Bank presented a $6,675 donation to Soldier On. The figure was derived from $25 per veteran who opened a checking account with the bank. 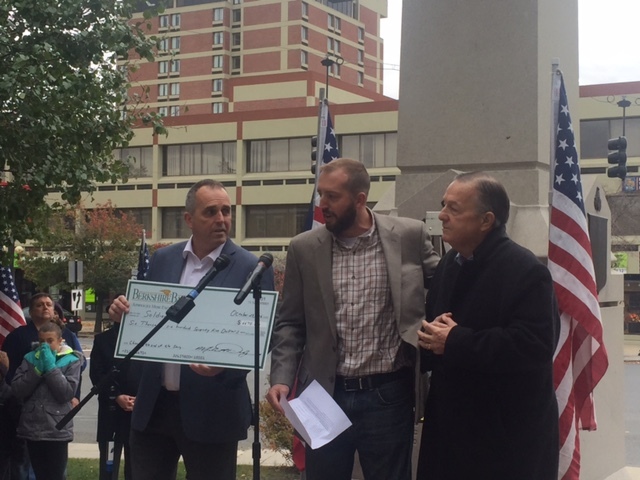 “If anything good can come from war, it is that this happens for guys like me,” said Cory Bazinet, a veteran presenting the check from the Berkshire Bank Foundation said. 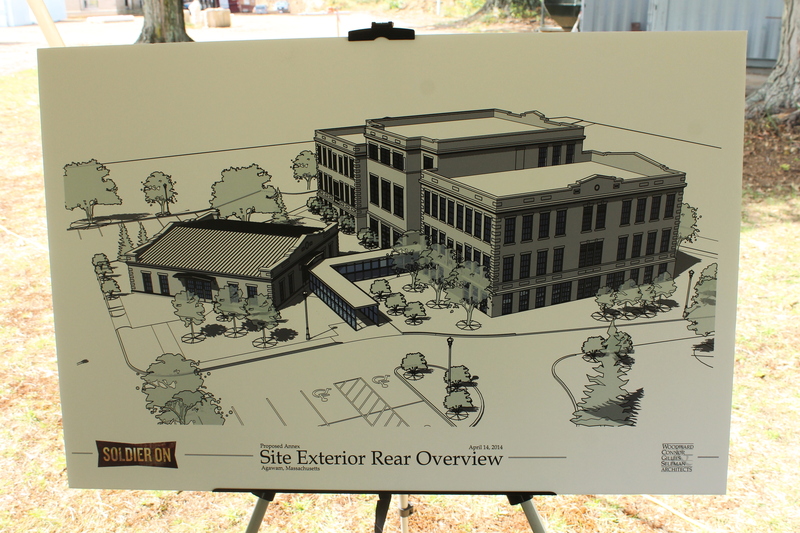 Soldier On is a transitional housing development for homeless veterans. CEO Jack Downing used the ceremony to announce that Soldier On is building a dozen more units at its West Housatonic Street campus specifically for women veterans. It’ll be the first village for veteran women. The nearly hourlong ceremony drew a substantial amount of people, who filled up most of the park. Kiwanis had been working on all morning installing the flags and the ceremony featured patriotic songs, Taps, a rifle salute, a missing man table ceremony, and a number of speakers. “I am very, very proud to be here to see this sea of red, white, and blue, said George DeLisle, Kiwanis Club district manager. 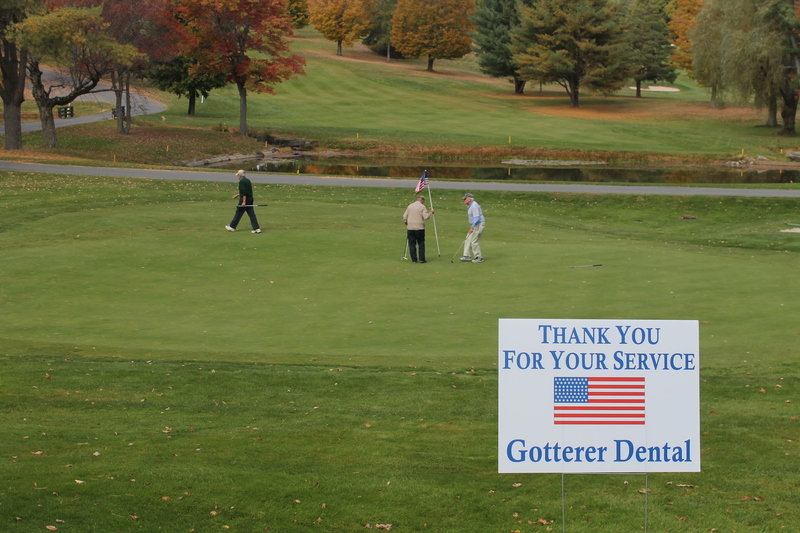 Country Club of Pittsfield hosted their first annual Veterans Appreciation Day on Sunday, October 16th. 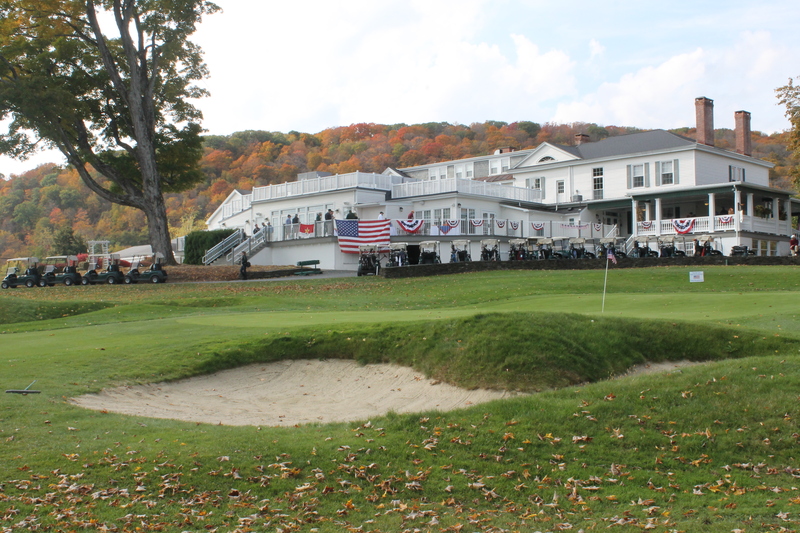 The country club invited all Berkshire County veterans that are golfers to enjoy the day with a luncheon and a round of golf. Soldier On will be receiving a donation for all the contributions from members of the country club and local businesses. PITTSFIELD -Russell Wyatt gets more more confident in his artistic ability with each passing day. The 57-year-old Navy veteran isn’t afraid to try new painting styles and a range of subjects from outer space to swinging in a hammock among birch trees. Wyatt’s art is also therapeutic as, once homeless in Philadelphia, he came to Soldier On in Pittsfield five years ago to get back on his feet. He has since transferred from the transitional care facility on West Housatonic Street to Soldier On’s permanent veterans housing next door. Painting was the emotional outlet Wyatt needed on the road to stability. “It’s helped me with my mental injuries; it helps me relax and is a great hobby,” he said. Wyatt is among the dozens of current and former Soldier On residents in Pittsfield and in Leeds enrolled in the nonprofit organization’s Veterans Community Arts Initiative. Several of the program’s artists will make their debut this evening during the city’s First Fridays Artswalk. Each month between 15 and 20 downtown businesses show case primarily paintings and photographs from local visual artists, with several of the venues having opening receptions from 5 to 8 p.m. The veterans art will only be on display during that three-hour period at the Intermodal Transportation Center on the corner of Columbus Avenue and North Street. Typically, First Fridays art is on display for the remainder of the month. Shortly after Soldier On hired Nathan Hanford as its art director three years ago, the Becket artist created the art initiative that has had a range of talent. “I’m working with people who’ve suffered strokes, never painted before or are seasoned artists,” he said. Transportation Center at the Intermodal Center in Pittsfield. Hanford hopes the First Fridays debut will lead to a more regular showing of the veterans work. He currently has a rotating exhibit of his students paintings at the Hilltown Community development Corporation based in Chesterfield, between Worthington and Leeds. “We hope that this is the beginning of an ongoing partnership between Soldier On and First Fridays Artswalk venues,” said Pittsfield Cultural Development Director Jen Glockner. The veterans art is the latest in art therapy exhibits taking hold during First Fridays Artswalk. The Berkshire Alzheimer’s Partnership “Memories in the Making” returns on Friday at Downtown Pittsfield Inc. after making its debut last year. 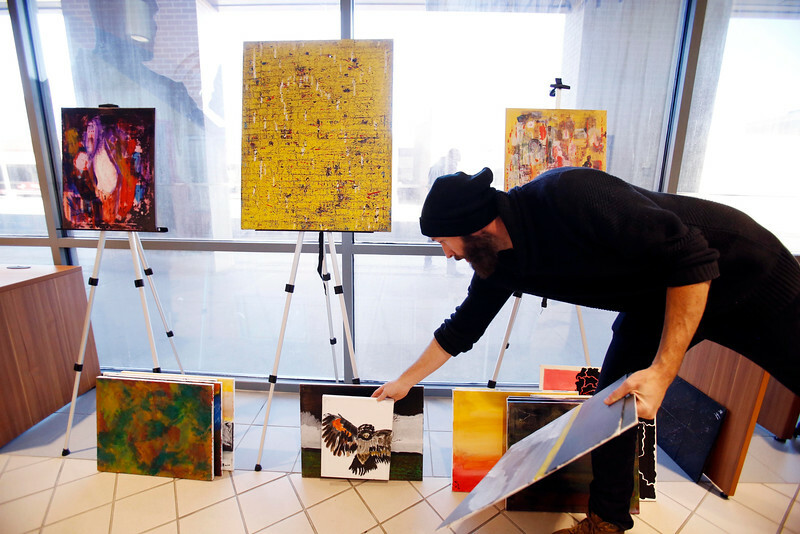 “It’s especially nice for the families of the Alzheimer’s patients to see their loved ones express themselves with these beautiful pieces of art,” Glockner said. The Soldier On art initiative has seen a few of its pupils hone their skills to the point it’s no longer a hobby, but a career. Hanford cited one veteran who has his own studio apartment in the downtown. “He’s painting profusely and having his own shows,” he said. 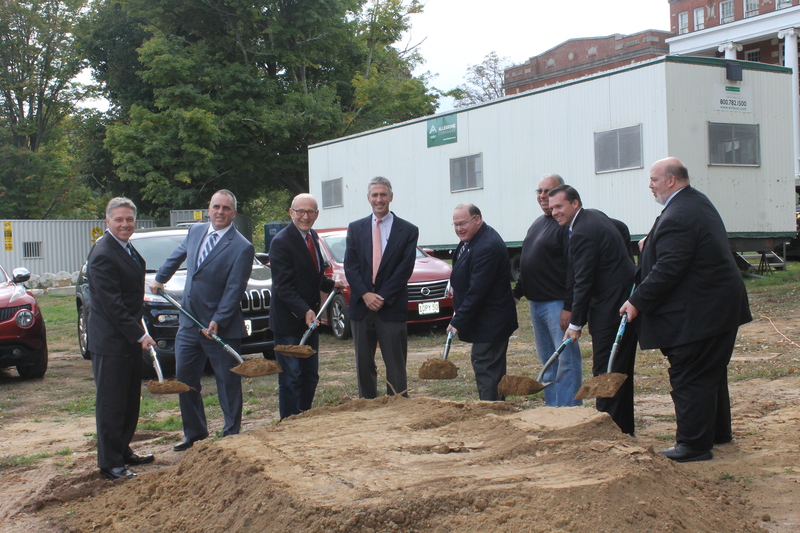 Left to Right: Girard “Jerry” Sargent of Citizens Bank, Bruce Buckley of Soldier On, Agawam City Councilor George Bitzas, Bruce Sorota of Stratford Capital Group, Mayor Richard Cohen, Agawam City Councilor Robert Rossi, State Representative Nicholas Boldyga, State Senator Don Humason. AGAWAM – Fifty-one homeless veterans will be able to live and contribute to the community when nonprofit organization Soldier On opens its new $24 million Gordon H. Mansfield Veterans Community sometime by the end of the summer of 2017. City officials, local representatives, executives from Solider On, and contributing partners for the project dug their shovels into the earth and broke ground on the project on Oct. 3 during a ceremony at the site of the former Western Massachusetts Regional Police Academy at 702 South Westfield St., which would be renovated and expanded for the project. Soldier On veteran residents looking at the former Western Massachusetts Regional Police Academy that will become the Gordon H. Mansfield Veterans Community. Buckley construction has begun work for the project, which would house 51 veterans. 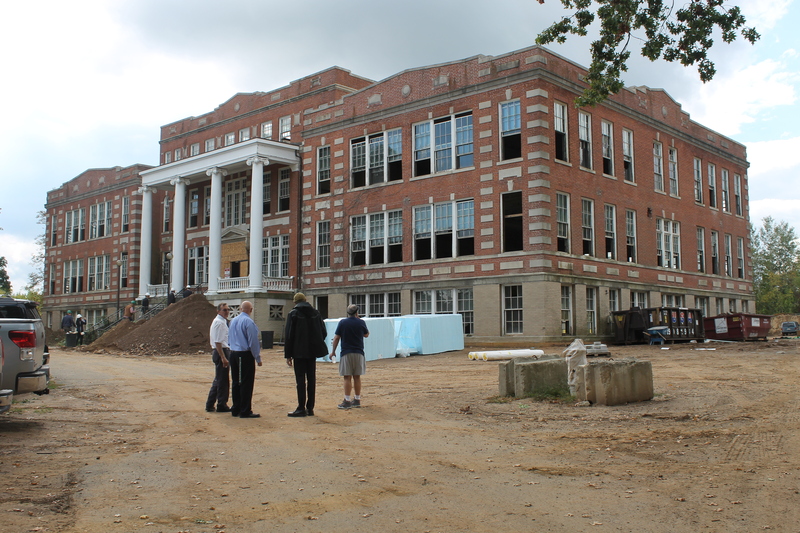 Forty-nine individuals would live in the rehabilitation building, and to the rear of the building would be new construction that would house two veterans as well as a kitchen and dining area. He noted at the end of August the organization opened a 43-unit facility in Chicopee. Buckley said the services provided at the Chicopee veterans community would also be provided at the Agawam location, including transportation and mental health assistances, job needs, and pharmaceutical requirements. “We also prepare at least one hot meal daily that’s available to each veteran,” he added. Buckley said the project is funded with state and federal historic tax credits in partnership with companies such as Citizens Bank and the Stratford Capital Group. He added chronic homelessness erodes a person’s self esteem and the project would seek to give homeless veterans an opportunity to regain their positive self worth. Mayor Richard Cohen said in July 2010 legislation was passed to allow Solider On to utilize the site of the former police academy. State Sen. Donald Humason said he’s proud of the region he represents because he believes his constituents care about the well being of veterans. State Rep. Nicholas Boldyga said he believes as a society people have to partner together to help veterans.